Okay, now that I've gotten that song out of my head, onto my card. Using Midnight Madness Challenge Sketch 9 as my inspiration and taking a few creative liberties, here's what I've come up with. I'm really not a ribbony (that's a word, isn't it) type of gal, so I omitted that and used the dot image in it's place. I did a little reverse Paper Piecing with my Send in the Clowns image from Artistic Outpost. What's REVERSE Paper Piecing you ask? Well, I actually started with the Lime Rickey paper from Basic Grey, that's my base layer (instead of stamping on White), then trimmed off the excess. I've found it's much easier to reverse Paper Piece this image then do it the normal way. So I actually pieced in the Clowns head and hands using White card stock, and the fluffy frilly part of the clowns costume with another pattern from the Lime Rickey collection. After the image was pieced, adhere it to White card stock for an Out of the Box look, then add your Black panel for depth. Did you know Artistic Outpost is having a Christmas in July SALE! ALL Artistic Outpost Holiday Plates are on sale through July 31st! Want a little extra savings? Use code LS-15off to save an additional 15% on your Artistic Outpost purchases! Click here to check out the great Blog Candy over at the MMSC Blog. Ohhhhhhhh, so that's how you do it!! You clever chickie you....thanks for the great example and the art lesson too! That is a wonderful card. I love the clown. Nice job. Thank you so much for playing with us this week at the MMSC. Hope you will play again next week. And she didn't want parades just passing by her... I'm adding to your song, thanks for getting that into my head. I love the clown - we all need more clowning around! Thanks for joining us at Midnight Madness and congrats on your win this week at MMSC. 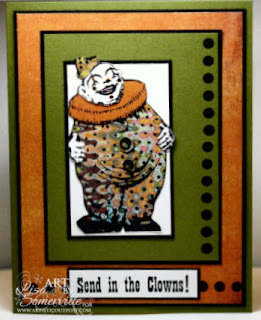 I love how you made the clowns body out of Basic Grey paper, will have to try this! Love the colors and the brads going down the side, great card! Hello dear :) as always your creations are fantastic. I am not a big clown fan, BUT I REALLY LIKE THIS ONE. I think it is because it looks vintage ;) Thanks for playing the Midnight Madness Sketch Challenges. Cute clown!! Love your take on the sketch! OH Wow! I love these colors Lisa!